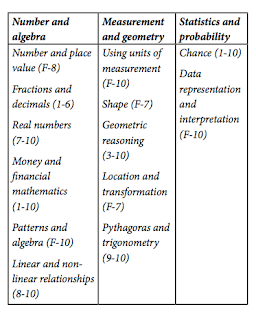 Here is a table that comes from a National Curriculum broadsheet. It contains some interesting insights. The first is fractions and decimals finished at yr 6. I haven't seen many year 10 classes confidently performing four operations on decimals or fractions without a calculator. The second is that I haven't seen many students enter year eight with adequate algebra skils. With the movement of year 7 to high school we can address some of these issues but it does not really address the core issue of the declining ability of primary to progress students through mathematics outcomes. 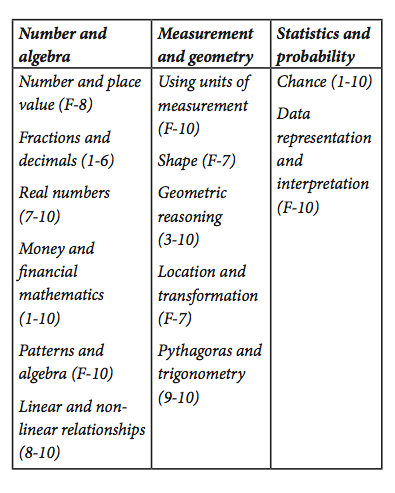 The national curriculum writers seem to acknowledge this issue here, "In comparison to the Singapore mathematics curriculum, the Foundation to Year 10 Australian Curriculum: Mathematics content is introduced more slowly in the early and primary years to ensure students have the opportunity to develop deep understanding before moving on. By Year 10, the conceptual difficulty is similar to that described in the Singapore documents." The responsibility has been placed on secondary school to accelerate through the course. This will have an negative impact on the second tier of students to be able to absorb the information in a developmentally appropriate method through upper school. It seems we may be revisiting the forgotten middle. The issue of why students need extra consolidation in primary is probably more cultural than educational in origin. With the loss of value and payoff of education in Australia, families are not supporting education in ways previously found. With changes to compulsory education, the value of graduation has decreased as a workplace differentiator. There are clear payoff changes exacerbated by the relatively high incomes available for manual labour related industries during mining years. Unless of a recent migrant group - education is a social occupation. Two parent working families have not been able to make the commitment to assisting students reach their potential. Sadly, even families making the commitment (to embed tables, assisting with homework, taking an active interest and are reading together regularly) are not gaining the benefit as the majority now lies on the other side of the divide. It is going to take considerable commitment by the department to turn this around, I think the community has already given up.